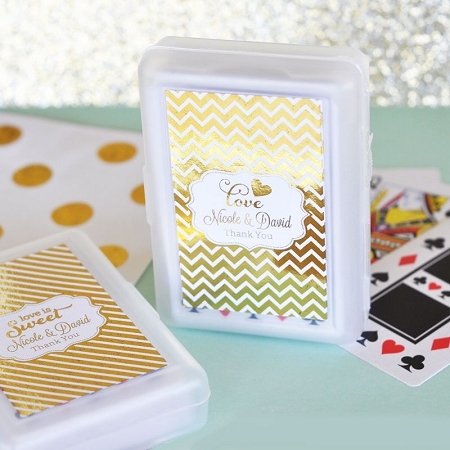 Play your cards right by giving your guests a winning hand with these personalized playing cards wedding favors with custom metallic foil labels. These playing cards come with personalized sparkling metallic labels for the cases that make this deck unlike any other. Choose from a variety of creative modern wedding icons for all season weddings as well as reflective foil designs that enhance every detail. You may also add names, dates, and messages to your label to remind your guests of this special event with every game they play. 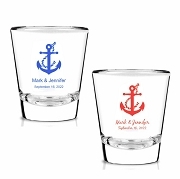 Let your guests know that you and your hubby to be are truly two of a kind with these personalized favors. NOTE: Personalized sticker are only for the cover. 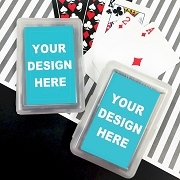 The actual playing cards cannot be personalized. I’m very happy with how these turned out. We ended up putting the stickers on them in one sitting with the bridesmaids. I only wish that the design on the actual cards was a bit nicer and a few of them were hard to open or close.